Although her life war shattered by her fistula. Rebecca Mambweni has been able to put the pieces back again with the help of a training programme. 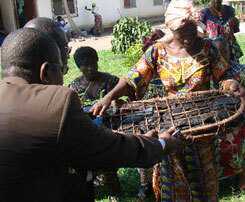 DRC/ LIBERIA/REPUBLIC OF CONGO -- It takes more than an operation to get fistula survivors on their feet. First there’s a recovery period, two weeks on average, so that the patients can heal after surgery. But it’s often a job or a livelihood that really helps them reclaim their lives. Because so many fistula survivors have been abandoned, excluded or shunned – often for years – a job or a business opportunity can mean renewed social connections and a sense of purpose, as well as a much needed livelihood. That’s why UNFPA supports programmes that give former fistula patients skills to achieve real freedom from the legacy of fistula. In the Democratic Republic of the Congo, former fistula patients are becoming skilled beauticians and dress makers. In Liberia, fistula survivors are making and selling soap, flowers, baked goods, dresses and fabric. 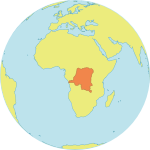 In the Republic of Congo, there’s an individualized approach with a focus on business and management skills. In all three countries, the women also receive coaching on life skills that can help them become successful and overcome their tragic pasts. “I lost all hope. I was abandoned by every member of my family. Now, some of them are beginning to relate to me,” says Nyamah Kollie, 39, one of the fistula survivors who benefited from the programme in Liberia after living with fistula for almost 20 years. The change in Rebecca Mambweni’s life is striking. She was just 23 when she went through days of agonizing labour before a dead foetus was pulled from her uterus. The trauma to her birth canal left her incontinent. Now, following her surgery and training as a beautician in DRC, she is employed and optimistic about her future: “I work in this salon, the Salon of Hope. One day I’d really like to have a salon of my own. I’d really like all those people that laughed at me to see me now. I just want to live a normal life,” Ms. Mambweni says. More than 350 fistula survivors have benefited from the social reintegration programme that has been put in place in DRC with UNFPA support, many of whom have been able to improve their living conditions with the training received. In 2011, UNFPA will work with other UN agencies in DRC, like the International Labour Organization, to create a cooperative of women and girls that can generate more opportunities and bolster their enterprises. The efforts are part of the global Campaign to End Fistula, an initiative spearheaded by UNFPA with a vast array of partners in 49 countries. Korpo Nelson, 39, a fistula survivor from Tubmanburg Bomi, Liberia, learned how to bake pastry while in the fistula training centre. She now sells her products to the patients in the same hospital where she was treated in 2009, after living with the condition for 23 years. After her fistula was repaired, Lorpo Sumo, 40, needed a way to maintain herself and her three children. She learned how to bake and sells cakes to the local community. In the first two weeks after returning from the fistula rehabilitation centre in Monrovia, she earned $30, twice the national average monthly income. More than 50 women have so far graduated from the social rehabilitation and reintegration programme in Liberia. Already one result is that about half of graduates are reunited with their husbands, whereas in the past the figure was closer to 25 per cent. Fistula survivors in the Republic of Congo can become seamstresses, learn how to market smoked fish, or develop a soap-making business. Those that come into the programme with existing skills get the help they need to build on them. One of the key elements of the programme is the individualized approach. Clients sign an agreement to work with a tutor who can help them build a business based on their existing or desired skills. The signed agreement entitles them to a bank account and training in business and financial literacy, so they know how to keep their books. Start-up kits provide them with essentials to begin a business of their choosing. For example, a seamstress might be given a sewing machine and fabric. Social reintegration activities also help to ensure that there is proper follow-up and development.